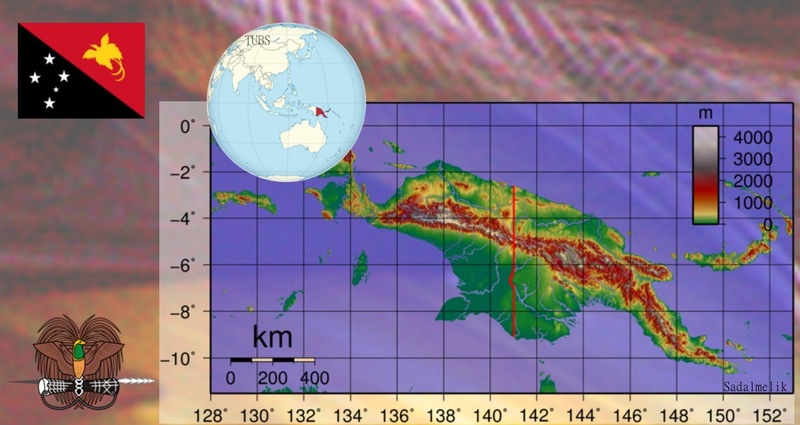 Reprocessing of vintage seismic has opened up new frontier exploration potential in Papua New Guinea. In recent years Papua New Guinea (PNG) has hit the industry headlines with the development of an active LNG export business, which since 2014 has been supplying gas from several large discoveries in the southern and western highlands of the country to the Asian region and is on target to produce 6.9 million tons of gas a year. Topographic map of New Guinea. The flag of Papua New Guinea and the national emblem of a bird of paradise over a traditional spear and a kundu drum are also shown. Crude oil production from the country’s existing mature onshore oilfields has been in decline for some time, however, and the search for new hydrocarbon resources has of recent years been moving offshore. To this end Australian-based DataReSource have reprocessed over 6,600 line-km of vintage Papua New Guinea 2D offshore seismic. The data covers areas of the Gulf of Papua in the south, as well as off the eastern side of Papua New Guinea including the Solomon and Bismarck Seas. This reprocessing, undertaken in collaboration with SAMIT Enterprises Pvt. Ltd., is the only known contemporary data set to cover four of the five major sedimentary basins offshore PNG, namely the Papuan, Cape Vogel, New Guinea, and New Ireland Basins. The reprocessed lines pass through all four of these basins, leaving Bougainville as the only major offshore PNG basin without coverage. Of these five basins, the Papuan Basin is the most explored, with over 275 wells drilled, and oil and gas potential is well established there, with known structural and stratigraphic traps in Jurassic, Cretaceous and Eocene-Miocene reservoirs. For the other areas the generation, migration and entrapment mechanisms are yet to be fully understood and the newly processed data provides an enhanced look into this potential. Drilling activity in these basins has been minimal to date, with some entirely undrilled. The interpretation of this newly processed vintage data is therefore going to be a valuable tool for a new understanding of the hydrocarbon potential of these frontier basins. The reprocessing of the vintage data has been carried out using state of the art processing methodology. The application of pre-stack time migration, surface-related and other multiple elimination techniques, carefully tested and parameterized noise elimination and signal enhancement routines have resulted in much improved subsurface imaging of the moderate to complex geological subsurface when compared to the earlier processed sections from the 1970s. More confident structural and seismo-stratigraphic interpretation of the geology seems feasible with the reprocessed data. A number of structural and stratigraphic features can already be identified in a preliminary review of the processed sections. Detailed interval velocity analysis based on migration velocity is expected to throw valuable new insight into the nature of lithology and porosity in these basins, leading to hopes of opening up a new frontier very near the heavily explored acreage in onshore eastern PNG. 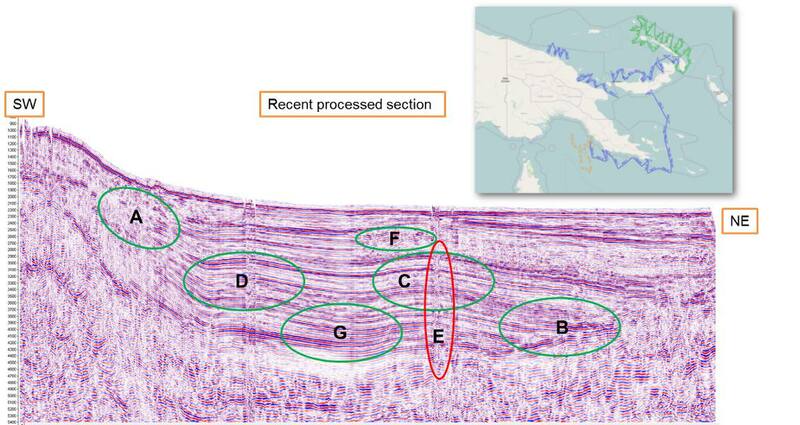 The presence of limestone reservoirs in PNG is already established and reservoirs in the various basins can be expected from the published literature and now through this new processing. The data can be obtained from Zebra Data Sciences as a full survey or on a basin by basin basis and can be viewed through a Virtual Data Room. The Bakken shale means that North Dakota is now the second largest producing state in the US.